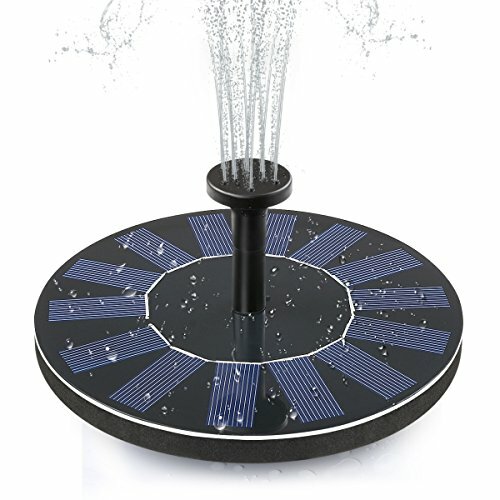 ADDTOP solar fountain is made up of highly efficiency solar panel and new brushless pump. Start-up fast, efficient and strong stability. In addition, it floats on the water and needs no electric outlet or external battery. The solar fountain is suitable for bird bath, fish tank, small pond, garden decoration, water circulation for oxygen, etc. Eco-friendly upgraded solar fountain: no battery or electricity needed, just floating the fountain on the water and it runs automatically in 3 secs when the solar panel get the full sunlight. Adjustable Water Height: To prevent water splashing from the containner, you can put the pump without nozzle on the water, the water will be sprayed directly from the F part and will not be spill out of the containner. 4 Different Spray Heads : The package contains four different spray heads for Different Water Styles. This is a floating water fountain pump, but if you don't want it floating everywhere, you can also use the suction cup to secure the pump. Multiple Application: this fountain can aerates the water and keep water circulating. very suitable for bird bath, fish tank, small pond, pool, garden decoration, water circulation for oxygen and etc. It can attract birds to bring your garden vitality. 12 Months Warranty: We offer 100% warranty and friendly customer service. So this is a No-risk purchase. You can contact us at any time, if there's any problem about our product, contact with us, We will reply you within 24 hours.